We’ll be using this topic to post release notes for new releases. Please use the various troubleshooting threads if you encounter problems during or after updating. There are no firmware changes in this release. If you have the latest version (2019/04/18), you do not need to flash your Spark. When in doubt, it’s best to be safe and flash your Spark. In the Process View edit modal, tools can now be swapped by hotkey. Keys are listed to the right of the tool in the side bar. In Process View, parts can be flipped again, using either the part menu, or the Flip tool. Improved part display in the “New Part” modal. Moved generic actions from the Spark Widget modal to the Actions button in the Spark service page. Fixed a bug in Graph where the config would be corrupted when changing display type. Fixed a bug in PID where Measured and Target output were displayed swapped. DS2413 actuators are now viable options when running the BrewPi classic arrangement wizard. For now, you must manually create the DS2413 actuator. A button to create new blocks was added to the wizard. This is a small release, to fix two serious bugs. We will be releasing new features after Easter. Fixed a bug where setpoint profile time values would be corrupted after changing them. Fixed a bug where some Block wizards would crash. Fixed how setpoint/sensor pair works, so that setting can always be set and enabled/disabled is handled separately. In Process View, rotated parts larger than 1x1 will have moved a few squares. Resolved multiple issues with setpoints. All fancy setpoints (eg. SetpointProfile) are now drivers of SetpointSensorPair. Thanks @j616s for the suggestion of making SetpointProfile a driver! Fixed a bug where disabling a PID would not set its output value to 0. Editing is now done in a fullscreen modal. The widget is never editable. Moved “Export widget” and “Delete all parts” actions to the edit modal. Parts are highlighted on mouseover in the edit modal. Editing can be done with selectable tools. Select a tool, and then click or drag parts. Click to add new part. Click to open part menu (edit settings). Click to interact with part (toggle valves and pumps). Parts now consistently react if you click in the square containing the part. When rotating parts, the upper left corner will stay in place. (the part used to rotate around its center). Fixed a bug where flows would be incorrectly calculated for rotated parts greater than 1x1. Improved responsiveness when moving parts. Improved collision detection when moving parts. HeatingElement parts can now be linked to a PWM Block, and will display the achieved duty setting. An error is now displayed, and the last change is rolled back. You can redo the change to continue. Widgets are now unpinned when moved or copied. Disabled the “Import Blocks” button while we fix some serious issues. When a service loses connection, a notification with a “Retry” button is displayed. This notification will disappear automatically if connection is restored. Made PID input/output blocks directly editable from the PID widget. This release includes a pretty big rework of the UI. The framework we’re using for UI components (Quasar) recently released a major update. While we were making all the required changes, we took the opportunity to revisit many of our more clumsy UI elements. We’re pretty happy with the result. It looks better, loads faster, and the underlying code is significantly cleaner. Lots of small display improvements throughout the UI. The dashboard background is now lighter than the widgets, improving contrast. Widget title is now displayed above the type to improve display of small widgets. Widgets now have a dropdown menu with additional actions. This allowed us to add more actions while saving space. Improved layout for all widgets and widget settings forms. Removed color from unimportant warnings (eg. inactive actuators). Improved and standardized the toolbar in modal windows (eg. Widget settings). The Block relations diagram is now displayed fullscreen. Fixed multiple issues with the Block relations diagram, and improved startup time. Reworked all wizards to be more consistent and easier to navigate. The widget options menu (accessible in dashboard edit mode) is removed. Added the widget actions to a dropdown menu. This makes copy/move/delete widget buttons more accessible. You can now resize widgets without activating dashboard edit mode. Widgets on the Spark page are still not resizable. Fixed an issue where the version would not display in the left drawer. Widget names no longer have to be unique. Block widgets now always use the Block ID as name. This improves visibility how widgets and blocks are linked. You can freely change names for non-block widgets (graph, session view, process view). You can now export and import widgets. For now the Process view is the only widget where exporting it makes any sense. Import widgets in the Wizardry menu. You can now export, import, and clear Blocks on the controller. The functionality is accessible through the Spark Service widget. Exporting Blocks will export all Blocks. Clearing Blocks will remove all user-added Blocks, and reset the system Blocks. Importing Blocks will first clear Blocks, and then import from file. Fixed a bug where the Lauterhexe Process view part did not have any flow. Added the small and large kettles to the Process view. This is in addition to the “normal” kettle already available. Added the Sensor display part to the Process view. It can be linked to a temperature sensor, and will display the value. Added the Actuator valve part to the Process view. It can be linked to a digital actuator (Actuator Pin or DS2413 Actuator). Toggling the valve will toggle the actuator, and vice versa. Fixed a bug where the eventbus would gradually consume more RAM, until it froze. IMPORTANT: this does not apply to this update. You will need to manually run brewblox-ctl flash this time. Updated the firmware system layer to version 1.0.1. This will be automatically applied when updating the firmware. Blocks now display whether their values are set by other blocks (eg. PWM controlled by PID). When a PID is disabled, it will stop overriding the setting of its output block. PWM and offset actuator can now be disabled separately. This allows manually setting their target. PWM now supports a 100Hz mode when controlling digital pins. This can be used for driving DC pumps or fans. This will be triggered automatically when the period is set to less than 1s. OneWire actuators still have a minimum period of 1s. Apart from these changes, we’re working on the implementation of a drag-n-drop interactive display of a brewery - flows included. https://brewpi-ui-demo.herokuapp.com/processview/herms-automated-valves is the prototype and proof of concept. The BrewBlox implementation will allow users to recreate their own setup, and control / view their blocks in the display. When the most important features are included, we will start drawing more attention to it in the UI, and add it to the BrewPi classic wizard. For those interested in an early preview: it is creatable as the Process View widget. This release includes changes to the firmware. To update, please run both brewblox-ctl flash, and brewblox-ctl update. The Spark LCD can now display temperatures as either Celsius or Fahrenheit. This is configurable in the Display Settings widget. Added a wrapper in brewblox-ctl to make HTTP request commands significantly shorter. Dashboards are now displayed as a list of cards on mobile devices. This eliminates clipping, but dashboard editing is disabled. Fixed a bug where you no longer could show/hide single values in graphs by (double) clicking. Graph values mapped to the right axis are now indicated by having a different color title in the legend. Fixed a bug where Spark Photon devices would not be discovered over USB. Added the --discovery=all|usb|wifi argument for the Spark service. This allows specifying connection type without hard-coding the address. Defaults to “all”. This can be used in combination with --device-id. This hopefully explains how to combine the various arguments that modify how the service discovers and connects to controllers. Liking the update the graph functions are great, works perfectly, for me anyway. One question, you knew it was coming, is there a way of making just the graph widget full screen? Not right now. We’ll probably implement it soon-ish, but it wasn’t deemed critical. Do you mean a button to open the chart of a graph widget in a full screen popup, similar to the chart button on the other widgets? I agree that we should add it. If you mean having a full page chart at all times, you can get pretty close by resizing the chart widget to take up the entire dashboard and closing the left menu panel. Did you flash the firmware during the update? Skipped over the flash part. Working fine now. Would this specifically be for the displayed time period, or also for the other settings? My BrewPi is currently solely used to control fermentation, for me at this point it would be just for the view of the graph. I know it is possible to do these things now but with programmable buttons on the graph widget it would be very user friendly. Perhaps we can just add some small buttons next to the dropdown: 1h, 6h, 1d, 7d, 14d. Open question is whether this should change the setting or be a temporary view change. @Trig both issues (full-screen display of graph widget, and display time presets) are resolved, and will be present in the next release. That’s great news Bob, thanks! New graph function is great! When enable is selected it just jumps back with the blue message again. The constraints on the fridge offset after the update appeared as -20 and 20. I have changed them back to 10 respectively. Have I missed something? 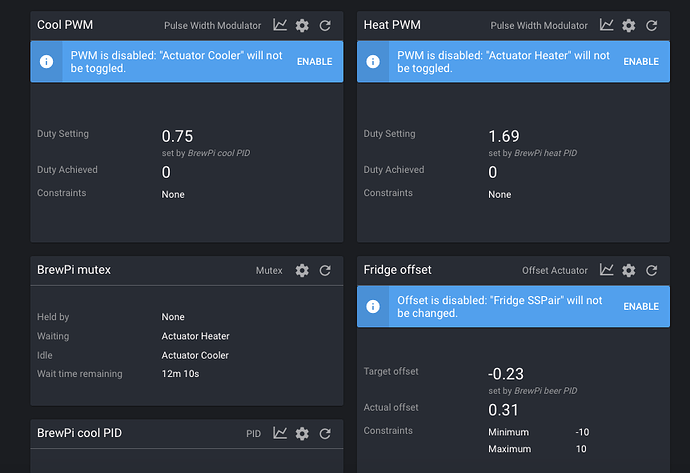 In addition to my last, I find I can’t now change the beer set point, the numbers won’t open up when selected and the fridge offset constraints have changed back to -20 and 20. Tried a reboot and re run the update without success.